A dental crown is a tooth-shaped cap which is placed over an existing tooth. The crown covers the tooth, restoring its shape, size and integrity. Crowns serve two main purposes. Firstly, to protect and maintain an existing tooth that is damaged or at risk of damage. Secondly, to improve the appearance of a tooth by fully encasing the visible portion of a tooth thereby covering any deformities or damage evident on the tooth. Our dentists at Lyneham Dental Care uses the CEREC (Chairside Economical Restoration of Esthetic Ceramics, or CEramic REConstruction) system to produce dental crowns. If CEREC is not suitable for you, we will work closely with local master dental technicians to keep you smiling. CEREC tooth restoration is an exciting system which preserves more of your tooth and produces stronger, better and longer-lasting results. 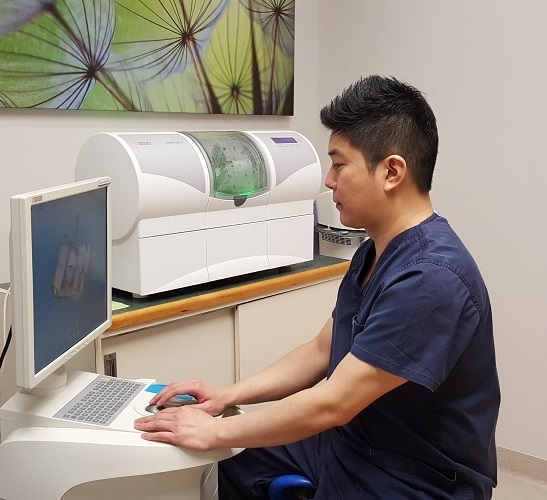 Using the proven technologies of CAD/CAM (Computer Aided Design/Computer Aided Manufacturing), the CEREC system incorporates a camera, computer and milling machine into one instrument. The CEREC system takes a picture of your damaged tooth and use the latest CAD technology to design a ceramic crown, veneers, inlay or onlay, and the CAM technology to create it. The custom-designed ceramic piece is then bonded to the surface of your existing tooth. This process is fast and removes the need for uncomfortable impressions, temporaries and a second visit. CEREC restorations produce a higher quality restoration, looking and feeling just like your own teeth. For more information and a video, please visit the Lyneham Dental Care CEREC website.